St. Augustine Beaches News Journal January 2012 6 Financial Focus Information Provided By Edward Jones Spiritually Speaking By Dr. Nicholas A. Marziani askfrnicholas@aol.com What Does Investment Landscape Look Like in 2012? Dr. Marziani, an education and spiritual life consultant, is Vice-President of the St. Augustine Beach Civic Association. Currently he is completing a novel based on East-West Church relations. Connie Reep Financial Advisor 1045 A1A Beach Blvd. St. Augustine, FL 32080 904460-1200 www.edwardjones.com Member SIPC MAKING SENSE OF INVESTING An Ordinary What?! As an investor, you know that 2011 was a somewhat choppy year, many ups and downs. So what can you expect in 2012? As baseball Hall of Famer Yogi Berra is quoted as saying: Its hard to make predictions especially about the future. And these words are certainly applicable for anyone who would like an accurate forecast of the investment climate. Yet we do know of some factors that may affect your portfolio in the months ahead. Here are a few of them: This past year, all the noise about the debt ceiling debate, the size of the situation tended to drown out some fairly good news: U.S. businesses balance sheets were strong for the most part, borrowing costs remained low, driver of stock prices. Heading into 2012, these fundamentals continue to look positive, which may bode well for investors. Greeces economic problems made a lot of news in 2011, but they werent the end of the story in Europe, as major Spain, Portugal and Ireland. Its by no means clear how these problems will be resolved, so dont be surprised to see them lead to intermittent, if short-lived, shocks to the markets. youre well aware, were voting for president in 2012. But you might be surprised to learn that the S&P 500 index has shown negative returns in only three of the last 21 presidential election years. Coincidence? No one can say for sure and at this point, no one can say if this pattern of positive returns will continue during this election year. Still, its an interesting phenomenon. So there you have it: the good, the bad and the quirky. Take them all together, and you still may not be able to foresee what will happen with the markets this year, but youll have a lot to think about. But instead of trying to predict what will happen in 2012, you may be better off following these triedand-true investment strategies: By spreading your money among a wide range of investments, you can reduce the effects of volatility on your portfolio. Keep in mind, though, that tolerance. If you worry excessively about much risk in your portfolio, which means you may need to make some changes. picture. Financial markets will always on your long-term objectives, and make decisions accordingly, you can avoid overreacting to short-term events. Like other years, 2012 will bring with it periods of both turbulence and smooth sailing. But by making the right investment moves, you can still chart a course that can allow you to move ever closer to your future goals. This article was written by Edward Jones for use by your local Edward Jones Financial Advisor. Has the gall to think talk with her, not at her. Is it crazy to demand an actual advisor? To expect that he listens as much as he speaks? Not to Edward Jones. With locations in neighborhoods, not skyscrapers, were built for easy access and genuine conversations. And have been for 88 years. Face time and tink time make sense. The focus of this column shifts Year. If youre into Maya calendars and other such exotica youre probably looking for the end of the world or some such by this coming December. There are not a few of us, however, who have waited for 2012 for a different reason, On this traditional eighth day of Christmas something very new is coming into being in the world of Anglicanism and Catholicism. It is the American Personal Anglican Ordinariate of the See of Peter and the Bishop of Rome, currently Pope Benedict XVI. Thats a mouthful, but in simple terms its referred to as the Ordinariate. Last year at this time such a new thing came into being in England; now we, her daughter nation the United States, have our own as well. Just what, you may ask, is an Ordinariate? And why should I care? Good questions, both. Let me answer Religious news as straight news is covered by the secular media with varying degrees of accuracy and completeness. Many folks dont care one way or another what goes on in the world of institutional religion, and the mainstream media often feels a need to either sensationalize or minimize developments in the same, depending upon their particular editorial bias and/ or their need for advertising dollars. What we have here is truly a new thing under the sun, and it warrants some attention by thoughtful people of whatever persuasion. And in this case its something that has a very personal application to yours truly, as youll see. U.S. Anglican-Catholic Ordinariate is a new creature in Roman Catholic canon law that establishes a territorial, nation-spanning diocese of former Anglicans, including Episcopalians and others who derive their spirituality and practice from the Church of England, who will keep much of their Anglican Patrimony but also come into communion with the worldwide Catholic Church. It has its own leader, or Ordinary, who can be either a bishop or senior priest, if married, and who sits alongside all the American bishops at national meetings throughout the year as a full member of that body. Oh, yes married clergy. That will be the norm for the Ordinariate, at least at the beginning. Later priest candidates will be increasingly encouraged to be celibate, but its anyones guess as to how general a rule that discipline will become down the line. And guess what, folks. This is also LOCAL NEWS! As I mentioned earlier, as I former Episcopal priest I have requested from the Vatican and received the required letter of permission that enables me to continue in the process to become a retread Ordinariate member of the clergy, a process that hopefully will reach its intended conclusion, my reordination as an Anglican-Catholic priest sometime early this summer. We currently have a small local fellowship in formation, St. James Anglican mission church, which meets in various locations convenient to its members. We will soon have a permanent arrangement for our meetings, which consist of weekly services of traditional Evensong on late Saturday afternoon. After my ordination we will, Lord willing, begin offering traditional Masses in the style of so-called high church English practice, a hybrid of the Book of Common Prayer and Catholic sources. Catholics attending the new Masses who choose to drop in one of our services (quite permissible!) will undoubtedly discover a richness in the liturgy that rivals that of the new Missal translations of the Latin Mass. OK, out of space! I encourage anyone who wants to learn more about this new development to contact me either at the email address listed above, or call me at 904.806.3037. Putative Mayan prophecies aside, this is a real centuries of longing for real unity in the Church which was fractured in the days of Henry VIII. And my personal of a longing of an old Jewish friend and former supervisor from my days at G.W.University that story will have to await another column! In the meantime God bless and love you all, Dr. Nick indoor Fitness room Atlantic Beach & Tennis Club 20th Anniversary Special! for St. Augustine Beach, Butler Beach & Crescent Beach. Save up to $150.00! 25% Advertising Discount Promotion New advertisers take advantage of a 25% discount off regular rates during the month of January for 2012. A great opportunity to reach the beach residents by US Mail. Go to www.beachesnewsjournal.com and download the agreement form and select If you have questions or need assistance with your ad, please call Todd or Cliff. Happy New Year! St. Augustine Beaches News Journal January 2012 7 St. Augustine Beaches Advisory Committee Ann Palmquist, Committee Member Palmquist@comcast.net Professional Packing, Shipping & Mailing Service Center (904)460-0022 With Safe ShipYou Have Options For info & directions please see www.safeshipstaug.com St. Johns County Sheriffs Corner By David Shoar, St. Johns County Sheriff Re-organization Salutations and good wishes for a prosperous New Year. The New Year, full of promise, resembles a clean slate waiting to be written on. A succinct appraisal of Advisory Committee (BAC) faced and met numerous challenges and worked to make this community an exceptional place we call home. Making a little history is what we do, having fun is how we do it. Three challenges, born in 2011, included promoting Art In Public Places, supporting Florida Friendly Yards practices (FFY), and protecting our valuable resources Trees! A forth challenge saved for last, needs you help, so keep reading. Supporting the Arts was realized in June with the formal opening of the Sculpture Garden at Lakeside Park and again in concerts held on the shores of Lake Anhinga. Thanks and appreciation go to Thomas Glover W. and Marianne Lerbs, Sculpture Garden Founders for their generosity of the sculptures and creative vision. Continuing this auspicious successful example into 2012 will be riveting to watch. The newly reappointed members of the BAC is proud of the supportive role it played in this venture. Promoting Florida Friendly Yards sandy soil; salty sea breezes to mist your plants; water restrictions; and the lovely but tender tropical plants best moved, inside before the and fauna issues because they know Dorothy a Florida gardener you are an indomitable, the faint of heart. In order to provide focus by example, your BAC and the newest committee member, Nana Royer, are engaged in efforts The City Commission approved the location, A Street and 2nd Avenue Plaza, so in concept this challenge is underway. In order to move from concept to kitchen table a lot of planning, sweat equity, and vision is needed. Green thumbs, wan-a-bees, and folk who want to grow something form the ground ( pardon the pun) are invited to contribute their: time, talents, ideas, and funding ($$$.) Organizational meetings will be in January so stay tuned or watch for the soon-to-be web site. When asked for his support Frank Charles said he was very at fundraising and would be willing to help this valuable endeavor. It is hoped his support and funding will materialize but dont wait to step up and help. Offering naming rights associated with you contributions is one idea and there is the possibility of growing the best tasting tomatoes ever! Stay tuned for breaking news and lets grow something tasty in 2012. Check out www.Citysprouts.com and see what is possible with this salubrious project. Recognizing the impact of the Citys valuable treasure, her Trees includes understanding the economic impact of trees: increased property value; environmental impact; air quality; wildlife and bird habitat; control soil erosion; and summers cooling shade. Congratulations to Max Royle and Melissa Burns, Finance Director, for shepherding the paperwork needed so once again the City of St. Augustine Beach will receive the 2012 Tree City Award. Nice going Melissa and Max. Requirements include the Cities commitment to devote two dollars per citizen to maintain and/or acquire trees. Arbor Day Celebrations supports the idea it is fun to learn, and introduced Learning Stations. Each Station hosted by BAC members or volunteers from the Master Gardeners, Garden Clubs, the Native Plant Society, the US Forest Service, and our own Chuck Lippie new Tree Ordinance in place promises 2012 will be a good year for trees, BAC hopes so. The New Year offers an additional challenge, St. Augustines 450th Birthday commemorations and the far reaching impact. What role or contribution does the City of St. Augustine Beach plan to contribution as part of these celebrations? Our city a young 53 years still a youngster in years, enjoys the notoriety and proximity of living next to an esteemed Grande Dame of advanced years. of tiny shells the Spanish called coquina, were quarried from deposits on Anastasia Island and used as building blocks to construct the Castillo de San Marcos. Fast forward and discover the strategic role played by the Light House (current structure 1874.) documented in diary entries and the Keepers log records write indispensable chapters in Maritime History. Continue along our shared timeline of the Civil Rights Movement and discover photographs, news paper stories, arrest records, and documents recounting the public swim-ins at the beach. History more recent feels like it is still warm. The City of St. Augustine Beach used a Chautauqua format to commemorate the Citys 50th birthday and was an example of History, done right. Presentations by noted from people who had been there, done that 2012 Make a Little History The New Year is always an exciting time. On New Years Eve we celebrate to either put a not-so-good year to rest or to count our blessings for a good year now passing. In both cases we welcome the next 12 months with eager anticipation that family and friends. I am particularly looking forward to 2012 and the continuation of some exciting and rather dramatic changes that have been implemented for your St. Every generation of law enforcement professionals has faced unique challenges and yet used those challenges to substantially improve their organizations and the quality of the services they provide. The depression of the 1930s, the civil rights era of the 1960s, the anti-war and anti-police environment of the 1970s and the crack cocaine epidemic of the 1980s all resulted in historic changes in the training, equipment and tactics we use to enforce the law and protect the public. In St. Johns County we now face another historic challenge. We must continue to provide premium law enforcement and public safety services in an environment of rapid population increases and revenue stream decreases. Thankfully at the SJSO we have a workforce of intelligent, hardworking people who have the creative energy to seek out innovative ways to address this mandate. As a result we have implemented a comprehensive change in the organization There is a growing consensus that law enforcement can best control crime and provide the needed public safety such as criminal hot spots, repeat victims and frequent offenders within a given geographical area, as discussed a couple of months ago in a column titled Intelligence in a county as large as ours and given that areas outside the Cities of St. Augustine and St. Augustine Beach which have their own police departments. Our plan has reduced the size of the geographical areas for which assigned deputies, sergeants and lieutenants are responsible and created a new streamlined command staff to lead them. The county has been divided into two regions each overseen by a Regional Chief. Each region has two districts commanded by a District Commander. The District Commander could be comparable to a local police chief for the district in which you reside. The four districts have separated the county in the Northeast, Northwest, Southeast, and the Southwest. as Central designed to perform the myriad of additional duties that are critical to public safety such as Investigations, Communications, the SWAT team, Marine and Air Units and other necessary specialized support services for the districts and the two regions. this plan will give you the opportunity to participate in the safety of your local area as you get to know patrol deputies, sergeants and lieutenants in your neighborhood and most likely your district commander who will be actively be involved in the local St. Johns County community where you live. This will be community policing at its best enhanced by the latest technology and best law enforcement support systems available today. As always I thank you for your support of the SJSO and welcome your comments and suggestions. My email address is dshoar@sjso.org. then the City evolved, how decisions made had lasting contributions, and some enrich this community and this community became a wonderful place to call home. The Mission for 2012, should you choose to except it, is far from impossible. You are invited to share suggestions, ideas, energy, and decide what role, or contribution this island and/or the City of St. Augustine Beach will play. Perhaps planting a historic garden, or work of Art with memory and hope for the past and to celebrate the future, or a map showing location of trees with memories of all 164,250 days and more. Historical events constitute the very bones marrow of City of St. Augustine Beach, the most beautiful city by the sea, and you are invited you to make a little history in 2012. St. Augustine Beaches News Journal January 2012 9 Beaches Bistro By Paolo Pece, Cafe Atlantico paolopece@bellsouth.net Chicken with Prosciutto and Green Olives Contemporary Italian Grill 904-471-7332 647 A1A BEACH BLVD. ST. AUG. BEACH www.cafeatlantico.net Dinner Mon.-Sat. 5-Closing Serves Four Chicken is a natural choice for Chardonnay, but chilies are not. The idea is to keep the chili addition minimal, so that contributes the deep-frying the garnish 8 ounces prosciutto julienned 1. For the garnish, cut the tortillas into halves or quarters and cut the rounded edges into a decorative pattern. Deep-fry in oil until golden brown. Drain on paper towels and set aside. 2. Blanch the onions in boiling water in a saucepan for 2 minutes; drain and cool. Peel and trim the ends, leaving enough of the root ends to hold the onions intact; set aside. 3. Cut the prosciutto into 1/4-inch pieces. Saut in a skillet until golden brown. Drain on paper towels and set aside. 4. Rinse the chicken well. Poach in the chicken stock in a wide saucepan for 10 to 12 minutes or just until cooked through. Remove the chicken from the stock and cover with a tent of foil to keep warm. 5. Add the onions, prosciutto, chili and olives to the stock. Cook over medium heat just until the onions are tender. Blend the arrowroot with a small amount of water. Stir into the sauce. Cook until slightly thickened, stirring constantly. 6 Cut the chicken into 1/4 inch slices, and add to sauce. Cook until heated through. Stir in the parsley, spoon into serving plates. Garnish with the tortillas and serve immediately. INSURANCE NETWORKFIRST FLORIDAFIRST FLORIDA IS ST.JOHNS COUNTYS PREMIER HOMEOWNER INSURANCE AGENCY St. Augustines Oldest Continuous Insurance Agency HOME REPLACEMENT YOUR HOMEOWNER INSURANCE PREMIUM ADDL DISCOUNTS AVAILABLE $200,000...............................................$641...............................home/auto discount up to 20% $250,000...............................................$795...............................home/auto discount up to 20% $300,000...............................................$948...............................home/auto discount up to 20% $350,000.............................................$1 101..............................home/auto discount up to 20% $400,000.............................................$1255...............................home/auto discount up to 20% $450,000.............................................$1409...............................home/auto discount up to 20% $500,000.............................................$1562...............................home/auto discount up to 20% $550,000.............................................$2256...............................home/auto discount up to 20% $600,000.............................................$2459...............................home/auto discount up to 20% $650,000.............................................$2658...............................home/auto discount up to 20% $700,000.............................................$2859...............................home/auto discount up to 20% $750,000.............................................$3061...............................home/auto discount up to 20% $800,000.............................................$3262...............................home/auto discount up to 20% $850,000.............................................$3463...............................home/auto discount up to 20% $900,000.............................................$3665...............................home/auto discount up to 20% $950,000.............................................$3866...............................home/auto discount up to 20%Prices based on 2009 Masonry Construction. East of the Intracoastal. Call us for the BEST rate for which you qualify. Quotes ar e subject to Underwriting Guidelines. 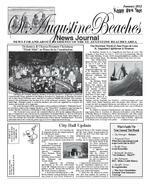 St. Augustine BeachesNEWS JOURNALP BEACHES AD PROOF JANUARY 2012 New Years Resolution: Examine Your Insurance Coverage Its the year 2012 and time to get all your personal and business affairs in order. Have there been changes in your life during the past 12 months that may warrant a change in your insurance coverage? Health Insurance Is there a new ad dition to the family? The birth of a baby or a new dependent that will need coverage? If youre thinking about switching plans this year, now is the time to start research ing different insurance companies. If you have recently married or divorced, you may need to add or remove your spouse from coverage, or acquire coverage in the event your former spouse has discontin ued your coverage. January is also a good time to open a Health Savings Account to save pre-tax money on insurance co-payments and out-of-pocket expenses. Auto Insurance If you have a new teenage driver in your household, check with your agent about auto insurance dis counts for students with good grades and a good driving record. Your Insurance agent can give you some basic tips on how to get the best deal and save money. Auto Insurance companies base some discounts on the less miles you drive each year. If youve recently entered retire ment, ask about changing your level of coverage, which may translate into dis counts on insurance premiums. Also, if youre thinking about chang ing cars, check with your insurance agent By Jane Tucker, First Florida Insurance about types of autos that may effect your premium rates. High performance sports cars cost more to insure because they are involved in more accidents, and they cost more to repair. Check to see if the car model youre shopping for is more likely to be stolen. Certain models carry stiff insurance costs. Life Insurance As changes occur in your lifestyle, it may be prudent to make necessary changes to your life insurance policy. Purchase of a new home, new car, or a new addition to the family means your responsibilities will increase. Your life insurance may need to increase as well. Does your employer provide free life insurance? Or, have you recently left an employer that offered it? Depending on your situation, you may want to consider obtaining new coverage or letting your current life insurance lapse, if your job Another good New Years resolution is to locate your insurance policies and share their location with a trusted family ments will be a relief when needed. First Florida agents invite you to take their Quote Challenge. Call First Florida to discuss your current policy coverages. Their goal is to be certain you have the absolute best rate for which you qualify. Call 808-8600, click on www. firstfloridainsurance.com, or come by to visit one of First Floridas friendly agents. 12 St. Augustine Beaches News Journal January 2012 Top Producer For Watson Watson Realty Corp. St. Augustine Beach Elaine Wallace Call Elaine at (904) 347-5439 3175-1 A1A South, St. Augustine Beach Broker/Associate, PA www.oldcitystaugustinehomes.com 2008 Best Real Estate Agency Choose Watson. Get More. TOP PRODUCER St. Augustines Top Producer, Eaine Wallace, has hit a level of achievement in real estate that few agents reach. Buying or selling, let Elaine put her experience to work for you. MARSH CREEK VILLA W/POOL Upscale 3BR/3.5BA home is located in a picturesque lakefront setting on a beautiful 60x150 lot in gated Marsh Creek. Heated inground pool and spa area is a tropical retreat. Interior crown gourmet kitchen. Clay tile roof, fountain and tropical landscaping provide fantastic curb appeal $499,500. TROPICAL LUXURY IN BERMUDA RUN. Step into paradise. Arthur Ruttenberg home in. Lanai doors recede into walls revealing a relaxing screened living area with small pool and fountain. 3BR/3BA with 2 MBR suites and chefs kitchen. Custom concrete block with tile roof. This home shows like a model. Small oceanfront community the discriminating buyer. $598,000. MARSH FRONT PELICAN REEF LOT Approximately one acre on the marsh in this intracoastal front community. Deep lot, 113 x 421, is one of the largest lots left on the island. Build your dream home and enjoy beautiful marsh views, sunsets, and wildlife. Gated security and community dock. $174,900. GREAT LOT ON WEST DONDANVILLE. Island lot is steps to the intracoastal and across the street from the ocean. Have the best of both worlds. Build your dream home on this available, terms negotiable. $109,000. .39 ACRE SEA COLONY LOT is a beautiful deep treed lot in The Estates section. Existing house plans are customized for this 95x173 lot, or use your own plans. Sea Colony offers upscale living near the ocean with community amenities. $195,000. MARSHFRONT CITY LOTS in uptown St. Augustine on Oak St. offer great views of the Intracoastal waterway and a serene pond. Peaceful setting yet walking distance to town and shopping. Two adjacent marshfront lots are 50 x 150 and priced at $59,000 each. 174 FT WIDE ANASTASIA DUNES lot, twice as wide as most lots for sale in the neighborhood. Beautiful gated island community with natural dunes and oaks. Enjoy the community pool or cross the street to the ocean. Lot is 174x128 and backs to preserve. $169,000. ESTATE SIZED IN SEA COLONY, this lot is over 1/3 of an acre and located in The Estates section, where beautiful seaside homes are situated on large lots. Plenty of room for your dream home on the 101x162 lot. Gated community offers pool, pavilion, and 4 beach walkovers. $199,900. THE ESTATES IN SEA COLONY is the location of this prime lot priced to sell. Lot dimensions are 56x154x193x42x191. Great opportunity to build your dream home or invest in this premier oceanfront St. Augustine Beach community $119,900. MARSH VIEW PELICAN REEF LOT in gated intracoastal community close to Old City, shopping, Anastasia State Park, and beach. Community offers a marina with boat slips available for lease. Jump in your boat and cruise the St. Augustine waterfront. Beautiful lot, 65 x 116, offered at $169,000. ONE LOT FROM BEACH with amazing ocean views. Just 100 ft from the Atlantic Ocean in St. Augustine Bch. One of few parcels available next to the ocean, a rare opportunity to see, smell and hear the ocean from your own property. It doesnt get any better than this! Lot plans available or build your dream home. $299,000. VILANO BEACH INVESTMENT HOME. 3BR/2.5BA with 2 car garage on Boating Club Rd is just across the street from the ocean. Excellent investment with great rental history and current bookings. This home is for the beach lover and is tastefully decorated to impress. Over 1600 s ft of coastal living with ocean views. Take a look and be charmed! $299,000. NATURE LOVERS DREAM IN TURTLE SHORES. It would be hard to intracoastal views. 4BR/3BA home with and a private deck. Great room features a sliding glass doors that open to a large private screened porch. Gated community offers pool, tennis, clubhouse, sauna and ocean access via a private tunnel. $329,500. OCEAN VIEW LOT ON MEDORAS AVE High elevation lot in Biera Mar provides great ocean views. This corner lot, 57 x119, is just steps from the ocean walkover. Build your dream cottage in a wonderful beach community with no HOA to contend with. Enjoy ocean views and breezes year-round. Amazing lot available at a great price. $120,000. ISLAND HAMMOCK HOME ON HALF ACRE. What a buy in one of the most desirable neighborhoods on Anastasia Island. You can hear the waves from this upscale home, or take a short walk to the beach. bathrooms and 2 car garage. It has a spacious island, and gorgeous master suite w/2 walkin closets. Huge lot, 149 x 152, and beautiful entry w/welcoming majestic oaks. $449,000.